As a quite technically oriented guy I read manuals even today and I prefer shops where I can see them before the buy. (Conrad Electronic in germany offers this on their website). I do this because I want facts and the technical fineprint and I want to see the possibilities and limitations of the product. But even for ton-technocal people the information would be useful - if it were enjoyable, as you say. That's an excellent question - and one that makes a lot of sense. I'm not going to pretend that I've come up with a good reason for not using the same skills to create your user manuals - I haven't managed to come up with anything to say that it's anything other than a good idea. There are very few people who can do it. In my experience the number of people who can pull together the necessary skills as a graphic designer, technical writer and technical product expert are diminishingly small. Heck, it's hard enough to find someone who meets just one of those skills at a time, let alone all 3. Which is unfortunate - because if more people couple learning material of that quality with the philosophy that your product is a "means" and not an "end", we'd all end up using (and producing) much better products as a result. Ummmm... why is this the first time I'm hearing this kind of philosophy? My impression is that most marketing materials are not reader friendly and informative. It is very hard to get facts from markteting materials that help finding a reasonable decision. Please don't let the marketing people anywhere near the manuals. Yes, the manuals should have a bit more effort lavished on them in terms of layout and design but if you let the marketing people anywhere near them you'll lose the technical information they are trying to convey. In my (limited) experience, manuals don't need to be "glossy" as much as they need to be written in simple, coherent language with simple, uncluttered illustrations. "Hi, I'm your talking CoffeeMaker. Press the blinking button on my base to start the introduction for new users..."
...or, more realistically, the marketing and tech writing staff (and web staff and product designers) should work closely together on both sides of the sale to ensure a seamless, pleasant, enticing customer experience from start to... well, we hope the relationship never ends! It helps to have someone in charge of Customer Experience whose job is very explicitly to ensure that the necessary cooperation takes place to create that, and that the results are consistently good wherever company touches customer. 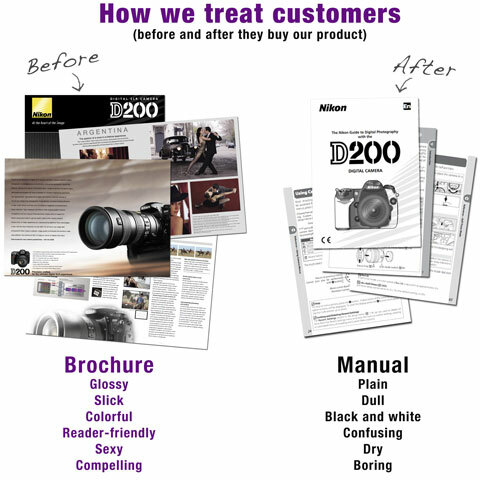 So marketing shouldn't make the manuals but should spend their money in that area rather than on brochures. Like the idea of doubling up and using the new documentation as part of the pitch instead of brochures too. You are of course singing from my Geek Marketing 101 songsheet so I totally agree, but I am reminded of a potential reason for the complacency you describe. I feel a post coming on. Too true. Customers who know how to use products are happy customers. I've often found that products that you can easily pickup and use are the ones you use most often. Having said that, at least having a boring manual is better than no manual at all. Kathy, there are a lot of great things in your post. Unfortunately corporations haven't truly figured out that customers don't care if the marketing dept and the pubs dept are under different VP's. In most organizations that I've seen, having pubs on time is just a checkbox in the product launch schedule. They're reviewed for accuracy, but little thought is put into the user's experience or the opportunity for ongoing branding. It's funny how marketing cares so much about persuading a customer to buy, but seems to drop the ball on actually caring for the customer. I'd argue this is actually a "meta" issue. Take for instance employers - in general, the only way employees can really move up is by changing jobs. A good friend of mine was telling me that his team has had lots of attrition and they're having a hard time filling openings yet raises are going to be capped - what message is that sending him? If you want to get what you're worth, leave. While I have heard of a few people getting good sized "market" adjustments, in general once you're in the door you won't be seeing much in the way of corporate love. That said, employees work in similar ways, often presenting a very glossy marketing document with a crufty user manual... And I won't even get into the whole dating/marriage game ;) Great post Kathy, hope you're feeling better! Kathy, you are making an excellent point. Marketing and communications should inform every single experience both within and outside an organization. It is indeed very hard to get that the energy and funds expended to obtain customers should in fact be multiplied or at least maintained in keeping those customers. It is hard for many reasons. As marketer and communicator I have always made it my priority to learn the business I was in – whether that be technology, risk management, chemical manufacturing or non-profit medical services – as well as the functional pieces within that business (customer service, R&D, sales, etc.) It takes time and tremendous commitment. The other consideration is that marketing is usually directly attached to sales; in my experience sales is rewarded on volume while marketing is compensated on holding pricing so there is a decent margin. This translates organizationally into tension where customer service is caught in between. It is hard to implement because it means a blurring of the lines and collaboration rather than holding onto a territory. It involves a commitment to working together and being responsible for each other’s success where most organizations continue to reward individuals for checking the boxes. It is more the model of the future, for survival and for excellence; what has started happening with open space, social networks and blogs. It requires changing our thinking as well as our behavior and that takes time. Time many would contend, some organizations are running out of. On the surface, this looks attractive. But as a technical communicator, I can see soooo many ways this could turn out even worse than the "dry boring, etc. etc." stuff on the right. Keep the actual goals of the user documentation in mind, and then use ideas from marketing materials to help achieve those goals more effectively. This is type of mindset is prevalent in one other major area...marriage. How many marriages do you know that fell apart because there wasn't "that spark" that was there when you first met. In the courting period, men do everything they can to get the girl, or in marketing terms, "make the sale." Once the marriage happens, there's nothing to pursue, nothing to work towards, and ultimately the consumer, or wife, loses interest. You've brought up an excellent point here, it just goes to show how this mindset is not just in marketing, but in the core of the human soul unfortunately. Stone Design - www.stone.design - does a great job in supporting their software and the software's users. They offer free upgrades for life. Their users become their best advertising and the user base continually expands rather than feeding upon itself. Every user has the latest version - so Stone only has to support one version. It's easier and better for Stone and the users - fantastic! Potential users trying out the product can easily use the user forums to receive support from happy users and the developer himself. Of course, I'm a satisfied StoneWorks user. I'm getting more out of the software now than I was when I purchased it over five years ago. I can't speak for other industries but from a camera perspective there is one that was left out as for why their manuals are so bland. In most cases Canon, Sony, and other manufacturers also release a field guide book that is sold seperately. If the manual was as useful as the field guide no one would buy the field guide which equals lost profits. Sorry, Stone Design's URL is www.stone.com. Wow, you _completely_ missed the boat on this article, Kathy! I think Phillip Fayers comment is bang on - you're confusing the rather minor issue of aesthetics with the more important issue of audience. Marketing targets a fundamentally different audience than user documentation. They deal with people that need to be persuaded, rather than simply informed, which is what user manuals are about. And persuasion requires fundamentally different material - it needs to be flashy and easy to digest in a very small amount of time. I.e. it needs to be great-eye candy that fits on one or two pages. User documentation on the other hand is for people you've already convinced, and are willing to devote an extended amount of time learning about how to make the most of the product they've already purchased. Thus, the material needs to be rich in content. By your logic, the marketing department should take over the customer support role, too, right? After all, Marketing can surely be more convincing as to why you should ignore the problems you're having and just use the 5 best features instead. No, leave the documentation responsibilities to the people who understand how users need to learn. Sure, spend some time making the front and back cover look nicer, sprinkle a few nice pictures at the beginning of each chapter, and make sure the typography and layout are pleasing. But please don't mess around with any of the content. I've bought the product already, quit trying to sell the damn thing to me and just teach me how to really, really love it for what it does. "The marketing and tech writing staff... should work closely together on both sides of the sale to ensure a seamless, pleasant, enticing customer experience from start to... well, we hope the relationship never ends!" I think every company that makes a product ought to have that as a serious goal. Neon: You're right -- a boring manual IS definitely better than no manual... although I've had some manuals that were nothing but an impenetrable waste of trees. Nick: I think you've hit a big problem on the head: "having pubs on time is just a checkbox in the product launch schedule." I've been to so many big foofy "marketing launch team" meetings, but rarely (and by 'rarely' I mean 'never') have I been to a lavish a "product manual launch team" meeting. Nate: Well done ; ) I think we call that, "false advertising" or... bait and switch? It is indeed a meta issue and applies to so many things. Valeria: we need more marketers with your oreintation and who care about ALL sides of the business. Milan: You made the REAL point: "use IDEAS from marketing materials to help achieve those goals more effectively." Paul: See: "bait and switch." I agree! daddydoodaa: thanks so much for the pointer to Stone... I'm going to spend some time exploring. Robert: Ah, I completely disagree with you on this -- my point is that persuasion and learning do NOT require fundamentally different material, and that in fact the people we most need to bring into the mix of learning/training/documentation are those with the skills to persuade, entice, compell, etc. I agree that user docs are indeed for people who are already convinced, but to assume that they're willing to devote an extended time to learning it is the one that hurts us. You did say the material needs to be "rich in content", and I agree... but presentation is a shockingly important part of what makes content rich. If it were just about the facts and information in the manual, then we wouldn't have RTFM as a mantra. My point is that the manual SHOULD be as compelling to read as the glossy brochure. Does it also need to be technically useful and correct? Absolutely, but those two aren't mutually exclusive. The best of all words would be as Deirdre said -- where we combine the best of both talents. And I'd also argue that most companies do NOT have documentation made the responsibility of "people who understand how users need to learn." Again, if that were true -- we wouldn't all be complaining so much about our manuals, and we wouldn't be moaning about our users who don't read the manual. They don't read the manual because the manual is usually technically correct but so brain-unfriendly as to be virtually unusable. A dry, boring manual talks to the mind, not the brain -- but it's the brain that we need to please. We do a great job of this with advertising and brochures--where we appeal to both their emotions and their rational mind, but we just let all that excitement go in the manual, and the reader has a terrible time trying to stay focused and engaged. I believe your wonderful line," teach me how to really, really love it for what it does" takes some of the same graphic design/writing loving care that we give to other more high profile projects. Maybe the best solution is to just make the resources of the graphic design/copywriting talent available to the people who make the manuals, and let those in charge of user learning direct those folks to help create the best, most compelling user documentation that makes it both productive and engaging to read the manual. Same reasons guys treat fiancees better than wives, companies recruits better than employees, cell phone companies switchers better than customers, 18-34 year olds better than over 55: getting is sexier than having. We're easily bored creatures. We take existing conditions (people, places, things) for granted and glorify the acquisition of new things, not the faithful use of old things. Basically, as a species, we suffer from ADD. In grad school I had a psychotherapy prof who used to wax eloquent about, "the addiction of the ego to 'more and more'; the call of the new"...truer words were never spoken. On the back of the instruction sheet for a new Rolodex(tm) monitor stand they had instructions for making a paper crane. The crane seems to be their mascot and is displayed on the box. A very surprising, but welcome, touch. What a great post! Well said. There is such an emphasis by marketers and sales executives to entice and motivate potential new customers, rather than focus on the captive mass and focusing on loyalty and retention. Treat your current customers the same or better, not worse. Turn them in to an effective viral marketing channel by engaging and helping them to become as passionate about your product as you are. You'll get the customers as a result.